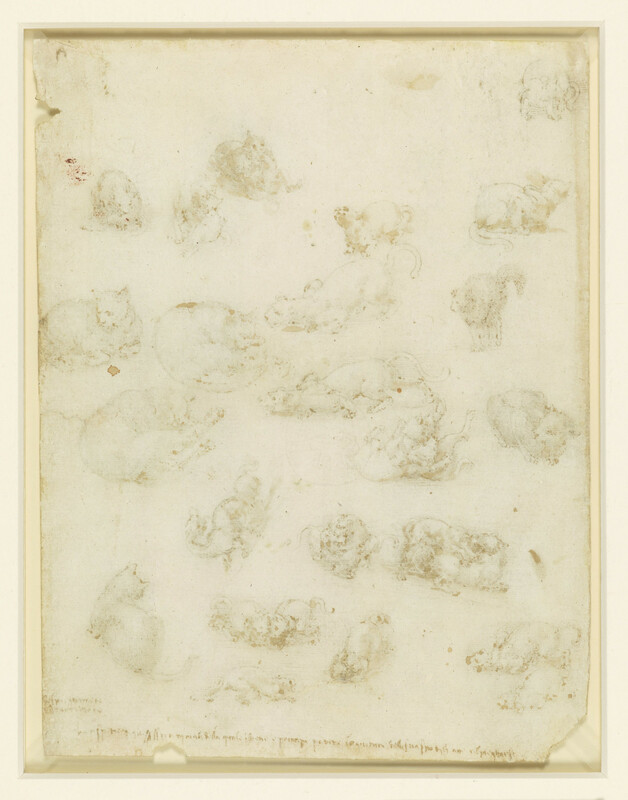 A sheet of more than twenty drawings of cats and lions in a wide variety of positions; lying asleep, sitting, prowling, playing, fighting, and in one case frightened, standing with humped back and fur standing on end; in the lower half, drawn at an odd angle, is a study of a dragon, with its head bent back over its shoulder. 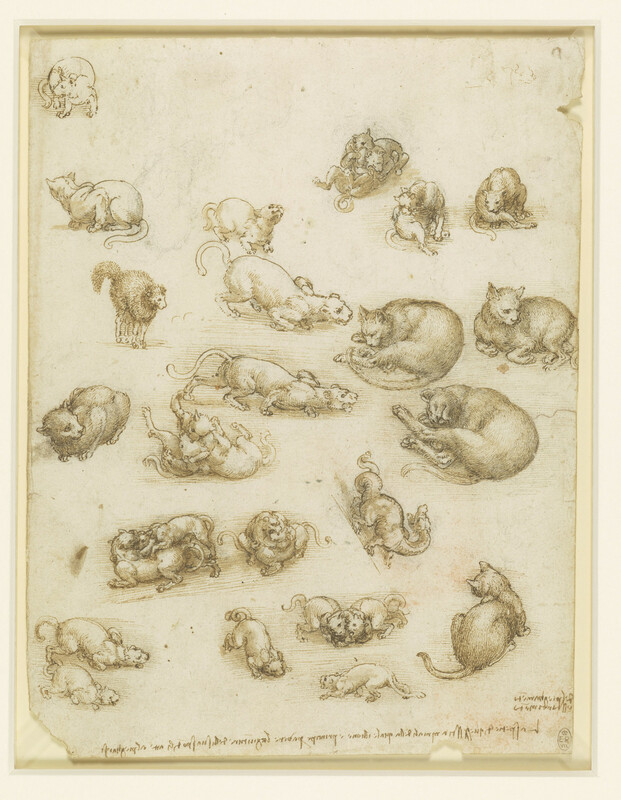 One of the most charming of all of Leonardo's drawings, it covers the full range of his modes from the most stylised and 'Leonardesque', in the coiling dragon, to the most acutely observed and unaffected, in the many studies of domestic cats. The most detailed studies, at centre right, show the cats sleeping, and seem to have been done directly from the life, with the subject motionless; by contrast the depictions of cats fighting had to be visualised on the basis of fleeting impressions. In most of the fights it is difficult to discern which limb belongs to which cat, and in the study at lower centre he has drawn the two cats locked together as a single unit, almost symmetrical, in the manner of a Romanesque carving. 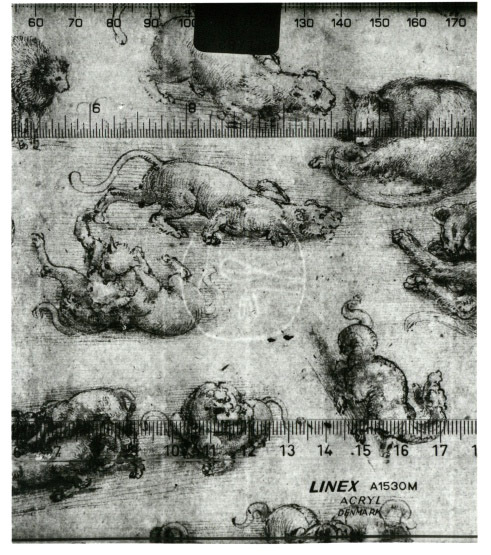 It is clear, therefore, that Leonardo's primary concern in these drawings was the variety of positions and movements attainable by members of the cat family, and that the dragon was added simply as a still more extreme case (as limited only the artist's imagination rather than by real anatomy). But while Leonardo expressed an interest in writing a treatise on animal movement – perhaps as displacement therapy for his treatise on human anatomy, work towards which had stalled at this time – there is no evidence that such a treatise was ever developed in any detail.